The sole purpose of this website is to aide the estranged Jewish people of Ethiopia. Estranged People is a charitable US organization that partners with Ethiopian-based nonprofit organization ESCO (El Shaddai Charity Organization). We hope to increase the flow of money into their poverty stricken society and provide them a sense of dignity. We hope that you will want to join in this cause and enjoy being the owner of the beautiful handcrafted items found here. Each item on this web site has been made by an individual of the Ethiopian Jewish community! Safe drinking water is a problem throughout all of Ethiopia, causing an estimated 80% of the health problems there. It is no different for the Jewish communities. A study done just a year ago on the Bete Israel community in Addis showed that the top ten diseases were water-related. Most water is purchased from someone. Ethiopians also collect rain water during the rainy season. Very few Ethiopians have access to get water from municipal sources or wells. None of the Ethiopian Jews that we saw had running water in their home. This water is used in food preparation and for cleaning. 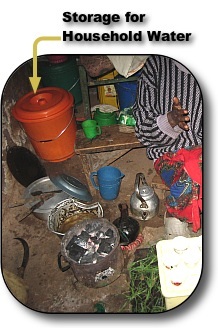 The water is stored in buckets, and retrieved by a bowl or pitcher to wash hands or use in cooking or cleaning. 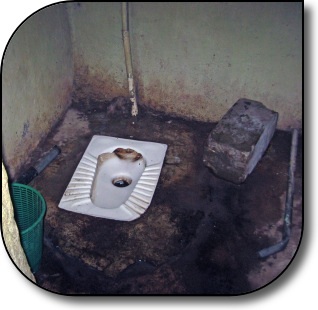 The majority of households use public pit latrines that are located in the vicinity of the rented houses, many use open field excreta and a very small percent use public toilets (a hole in the ground with a tank to flush away waste). I did not ask to take pictures of their latrines or waste fields, but did take this picture of a public toilet the second and last time I ever used one. Fortunately the clinic that we stayed in had a western style toilet.